The kickoff of the Vandals' 2015 season. Idaho did not win their opener last night, which was the opening night for all Inland Northwest football teams. I will get that out of the way. They very much lost by a score of 45-28 to Ohio University (which is not the same thing as the Ohio State) and that score only looks as bad as it does because of a late score. It wasn't pretty, but the Vandals, who, as I hate reminding folks, have only won five games in the last four seasons, didn't get blown out. There were a few signs, here and there, that Idaho will not suffer as much as they have in the past few seasons. That may be wishful thinking, but I know what I saw. I'll get to those upward looking signs in a second and all the nuts and bolts, but first you need to know about these Idaho football games. There might not be anything like it in all of the FBS ranks. It's a small town affair that's both delightful and at times sort of sad, but totally worth the $15 that almost all fans paid to get into the concrete confines of the Kibbie Dome. In the parking lot before the game, tailgate parties peppered the grounds and the school's new fan center — featuring a bouncy thing for kids, a bar for adults and ample televisions for people who wanted to see that North Carolina vs. South Carolina game — seemed to be a hit. At the tailgates, beers were consumed, as they should be before any football game on the planet, and the scent of grilled meat was everywhere. For a Thursday afternoon, this wasn't a bad showing for a fan base that has seen such little success in so long. There was some hope in the air, even if some folks were still smarting from the football program's couple weeks of very bad off-the-field press. Everyone was in black and from a distance you'd think this was a prefunk for a Metallica concert, until upon further inspection the belt buckles and gray hair became apparent. In the landscape of FBS football, this is about as small-town as it gets, and it's hard not to find this utterly charming. The student body came out in force, especially considering it was the Thursday before a three-day weekend and the kids could have easily skipped town a day early. These youngsters, faces ruddy from Fireball shots and the warm temperatures of the indoor stadium, carried with them the giddy buzz of a new school year and a season that maybe, just maybe, would bring them more than just the one win they've seen in each of the past two seasons. It was hard not to want a win for those kids. But they didn't get a win. In fact, they saw a lot of losing ways right off the bat when Ohio sped to a 21-0 lead on some deep passes through the middle of a porous Vandals secondary and an interception thrown by Idaho's sophomore quarterback Matt Linehan that went for a touchdown. Idaho's workhorse running back Elijaah Penny plunged into the endzone midway through the second quarter to make it 21-10. Ohio countered with a four-play drive for 79 yards and a touchdown before Idaho's All-American kicker/punter (and Spokane native) Austin Rehkow added his second field goal of the half to make it 28-13 at the break. The second half featured a Vandals passing attack — highlighted by senior receiver Dezmon Epps' 15 catches and 163 yards — that looked markedly better than in the opening two quarters. When the game seemed out of reach, Linehan scampered for a couple first downs and converted some nice throws on fourth down, which led to a couple touchdowns to make it 38-28 with less than three minutes to play. The offense looked as good as it has during the Paul Petrino era, which isn't saying much, but it's something. The problem, though, was the Vandals' defense, which was bulldozed in the closing minutes during which Ohio scored with ease. Ohio's two-quarterback attack went 20-25 for 284 yards and they racked up another 205 yards on the ground. That's a problem. So it was another loss for a school that's seen a hell of a lot of losses. 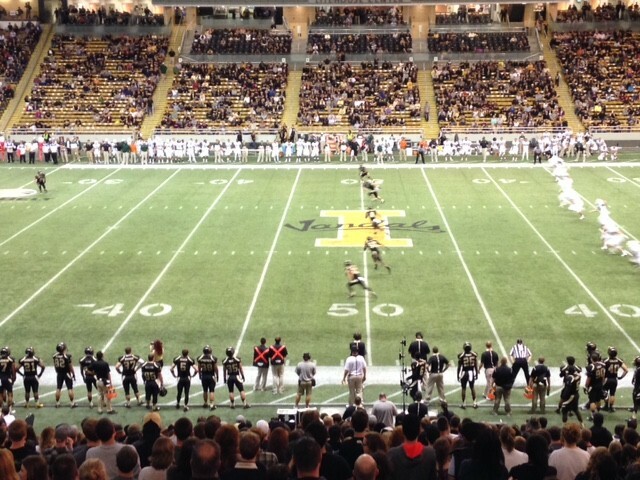 In all, 11,587 Vandal fans packed into the Kibbie Dome, which only holds 16,000. This was not, however, the smallest crowd for Thursday's slate of games. Ball State only brought 10,473 fans to its contest against VMI. So, the Vandals had that going for them.